When the “fast” simple moving average crosses above the “slow” simple moving average by the number of pips specified, a buy trade is opened. Note: Trades are closed with a stop or a limit, whose price is defined by the user. All trades open at the close of the current candle. Only one trade at a time is opened, regardless of the number of crossovers that occur. When the “fast” moving average crosses below the “slow” moving average by the number of pips specified, a sell trade is opened. ExtendCross: The number of pips the “fast” Simple Moving Average must advance above or below the “slow” before a signal to buy or sell is created. This Expert Advisor (EA) is only compatible with FXCM MetaTrader 4 software. 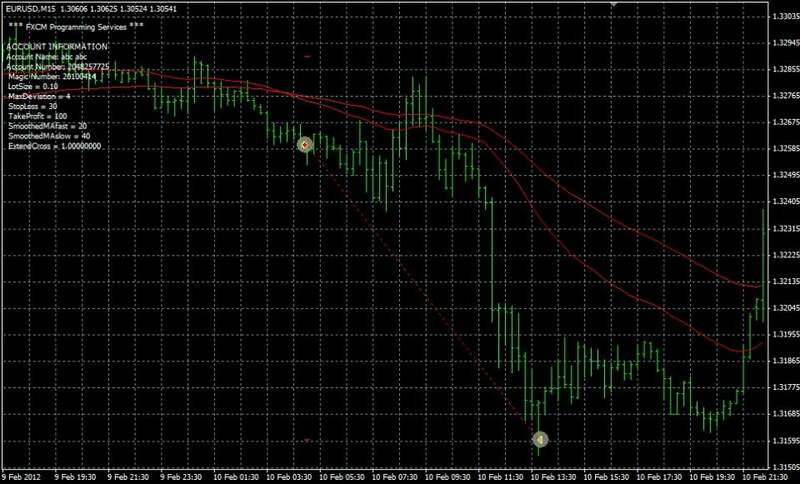 It does not operate on MetaTrader 4 software provided by any other brokerage. In order to purchase or download the app, an FXCM live account is required. Once downloaded, the app can be used on both live and demo FXCM accounts.